The United States Geological Survey (USGS) has been doing an utterly stellar job keeping an eye on the ongoing, ever-evolving eruption at Kilauea, involving both explosive summit events and the continual effusion of lava along its flanks in the Lower East Rift Zone (LERZ). From drone footage of the last fissure standing – number 8 – to geologists going up and poking the lava itself with a shovel, they’ve got you covered. Lately, they’ve been summarizing events. 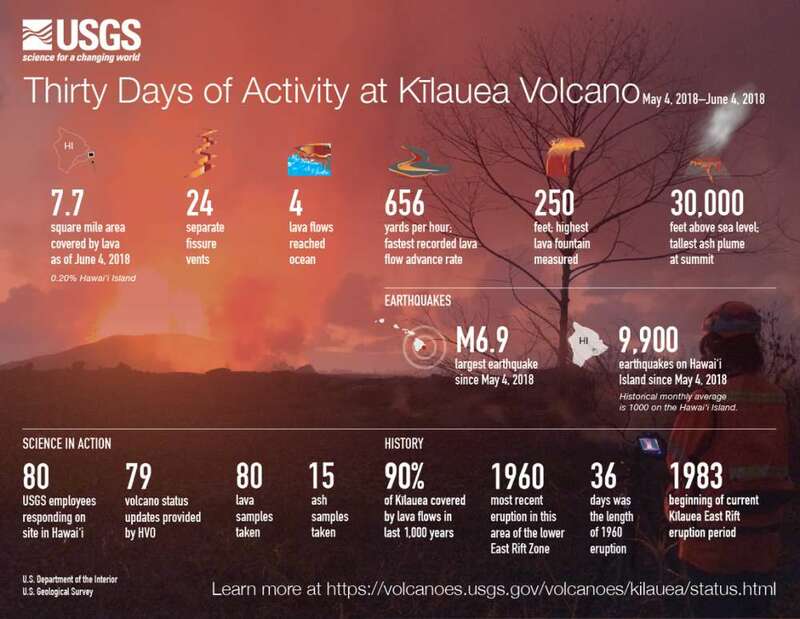 As a recent infographic revealed back on June 5, 30 days after this particular eruption began, about 20 square kilometers (7.7 square miles) of Big Island had been covered in lava, emitted at different times from 24 fissure vents. This sounds like a lot, but it’s worth remembering the eruption is only happening in one corner of the island. The “Big” in Big Island isn’t an understatement: it’s about 10,430 square kilometers (4,027 square miles) in size, which means that the aforementioned lava has only covered 0.2 percent of it. Saying that, the USGS noted that in the past millennium, 90 percent of the island’s Kilauea volcano has been covered by lava flows. It can’t be understated that this is, without a shadow of a doubt, the world’s most active volcano, with the current eruption period starting back in 1983, featuring a (now-drained) lava lake and the occasional overflow and lava outbreak. The most interesting factoids, however, have just been released. On the USGS’s Twitter feed, they’ve kindly shared with us the most up-to-date (as of June 7) stats. Remarkably, since May 3, there’s been enough lava effused to fill 45,400 Olympic-sized swimming pools, that old classic volcanological comparison unit. That, as they also note, is enough to cover the whole of Manhattan Island nearly 2 meters (about 6.5 feet) deep. Just before you think that’s impressive, though, the USGS also explain that this is just half the amount unleashed during the 1984 Mauna Loa eruption. Mauna Loa, another of Big Island’s volcanic treasures, hasn’t erupted since then, but boy was it a doozy. Following three years of slowly intensifying seismic activity, which culminated in a fairly deep swarm in mid-September 1983, the volcano began to inflate shortly after a brief, fiery summit eruption. The eruption began in earnest on March 25 in the middle of the night. The volcano began to glow, and fissures appeared, moving quickly down the southwest rift zone. Lava fountains made an appearance as masses of fast-moving lava began to flow in multiple directions, including toward the town of Hilo. Methane explosions caused by the thermal decomposition of buried vegetation also took place. Fortunately, Hilo was saved when natural blockages to the lava, as well as changing eruptive conditions, spared it. Plenty of lessons were learned back then, and the same clearly applies to the events of 2018.